The plant Cannabis sativa has been widely used by humans over many centuries as a source of fibre, for medicinal purposes, for religious ceremonies and as a recreational drug. 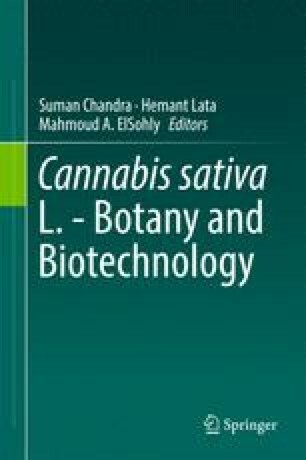 Since the discovery of its main psychoactive ingredient, Δ9-tetrahydrocannabinol (THC), significant progress has been made towards the understanding (1) of the in vitro and in vivo pharmacology both of THC and of certain other cannabis-derived compounds, and (2) of the potential and actual uses of these “phytocannabinoids” as medicines. There is now extensive evidence that the pharmacological effects of some widely-studied phytocannabinoids, are due to their ability to interact with cannabinoid receptors and/or with other kinds of pharmacological targets, including non-cannabinoid receptors, and this makes the pharmacology of the phytocannabinoids rather complex and interesting. In this chapter, we provide an overview of the in vitro pharmacology of five selected phytocannabinoids and report findings that have identified potential new therapeutic uses for these compounds.